"Every $ we spend in this world serves as a vote for a cause. Through the art of film, my aim is to inspire a better world. My method is to produce films of a conscious and moral nature. Films that inform, empower and inspire audiences with untold perspectives on various topics that afflict the world at large! Your support is the key to being able to make such films a reality. We are all co-creators in this experience and with every individual choice that we make, we collectively give birth to and shape our future! I want to give YOU the power to choose and Crowd-Fund my many planned film projects. 'Turn your eye inwards and see the truth!' 'Spiritual Awakening: Journey to the Inner Self' from the creator of multi-award winning Internet blockbuster '2012 Crossing Over: A New Beginning,' Amel Tresnjic. Plot: 'Spiritual Awakening: Journey to the Inner Self' embarks on a spiritual journey to the true nature of our being and seeks answers to the deeper meaning of life. Who am I? What am I? What is this place and what am I doing here? Where did I come from and where will I go after I die? From inquiry of these questions a spiritual path is born, which leads to self-realization and the discovery of the true nature of Self. The feature documentary tells a true story of ordinary individuals who have experienced a very rare spiritual phenomenon called 'Kundalini Awakening.' It is described as a sacred experience where an individual comes in contact with a transcendent reality, an encounter or union with the divine. The film explores those extraordinary insights and how they positively changed their lives forever. 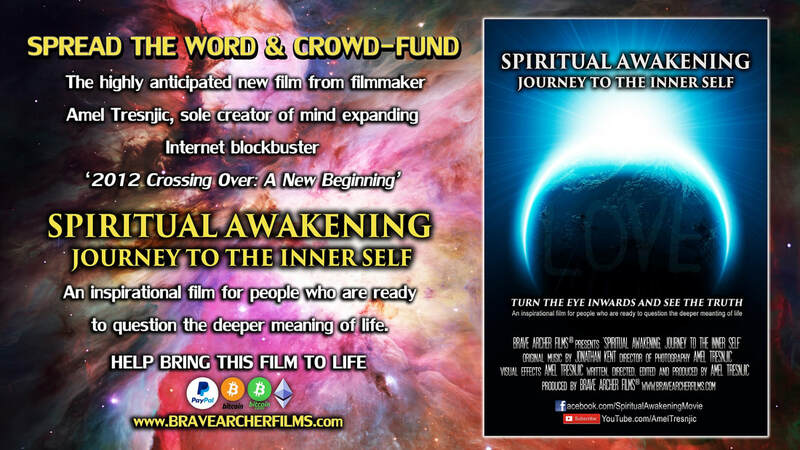 This highly anticipated new film from filmmaker Amel Tresnjic, sole creator of life changing Internet blockbuster '2012 Crossing Over: A New Beginning,' is a scientific, spiritual and philosophical perspective on the awakening of the new wave of consciousness. Furthermore, it provides an empowering message on how every individual can contribute towards making the world a more peaceful and loving place. This uplifting and inspirational film aims to empower audiences and encourage them to seek spiritual wisdom for a greater understanding of our true nature and purpose in life. Looking at the world of today, spiritual ignorance has caused humanity to drift far from its nature, which is crucial to our survival and sense of belonging. Now it's time to journey back home, home to our natural state, the state of love and happiness. Are you ready to embark on your own spiritual journey?